Kerala HSCAP Transfer Allotment result for admission to HSE Plus One courses to be published by Kerala DHSE. The candidates applied for admission to Kerala Plus One (+1) Courses through School/Combination Transfer can check their result on HSCAP website. 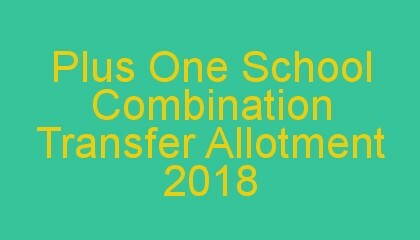 Candidates will get the School/Combination Transfer Allotment result from the link “TRANSFER ALLOT RESULTS”, they can take the print out of the allotment letter and report to the college . Kerala Plus One school combination transfer allotment 2018 result will be published on official web site of HSCAP www.hscap.kerala.gov.in. Click “TRANSFER ALLOT RESULTS” link. Enter your Application Number,date of birth, select district and click submit button. The candidates who applied for the HSCAP 2018 and still do not involved in any of the allotment can apply for Plus One Supplementary allotment 2018 from 28-6-2018. Such candidates can renew their application by submitting the Renewal form to the previously applied school.